Our trays are highly appreciated for their durability and optimum storage capacity. We offer 98 Cavities Nursery Trays in different sizes, colors and can also customize these trays to suit client’s requirements. Based at Bengaluru, Karnataka, we are engaged in offering a wide range of Plastic Stacking Crate Vented Tray, Plastic Horticultural Trays, Seedling Tray, Stacking Plastic Tray and HDPE Bottles. In addition to these, we also provide Plastic Container, Vacuum Forming, Blister Forming Machine, Plug Trays, Agro Trays, Nursery Trays and Propagation Trays. 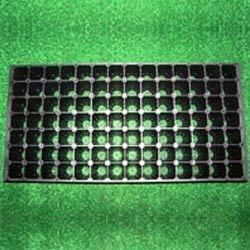 Our range of trays is superior in quality and finds application in agriculture sector for seed plantation. Moreover, the different types of machines which we offer are used for packaging purposes. Our organization has earned immense market appreciation owing to the superior quality of products and customized range. We also maintain a healthy relation with the clients to keep them associated with us. We also facilitate our clients with easy payment modes such as cash, cheque, credit card, DD, LC, and pay order. Apart from quality range of products, we also deliver our consignments within the stipulated period of time.